Welcome once again, to your one stop place for the wearable tech stories that didn't quite make the cut on our dedicated news page this week. Losing out to Fitbit's big sleep tracking update, Microsoft's new Band 2 strap and wearable tech starring at the Cannes Lions 2016 festival among others, we've picked out the wearable news blips and murmurs of the past seven days that you might have missed. 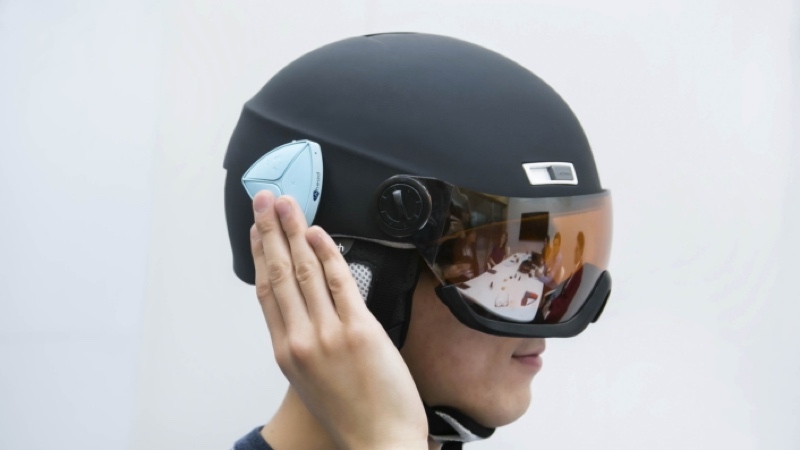 Samsung Ahead, a communication device born in the Korean company's spin off C-Lab could be heading to construction sites, ski slopes and race tracks in the near future after a trademark was filed for the smart helmet. Unveiled at Samsung's Developer Conference earlier this year, Ahead takes the form of a small triangular device that attaches to any helmet via magnets. It then enables users to make and take calls, play music and receive voice notifications wirelessly over Bluetooth. There'll also be a Push to Talk version of the Ahead, which supports the ability to communicate with multiple users at the same time via a two-way radio connection. It looks like we have our first piece of concrete evidence that Google Glass Enterprise Edition is real after the name was mentioned in support pages for the second generation AR eyewear. Along with with confirmation of the name, we now also know that Glass 2.0 will come with an Enterprise Edition Wearable Battery Pack. If you're really interested, you can also read warranty information and regulatory information about the new Glass, which is now live on the official Glass website. Despite the mounting evidence, Google still hasn't officially confirmed that the Enterprise Edition exists. We're going to get technical for a moment. While a whole host of wearables rely on a 3-axis accelerometer to track movement, Bosch Sensortec this week unveiled what it says is the world's smallest 9-axis motion sensor. Designed with smartphones, smartwatches and other wearable devices (including smart jewellery) in mind, the tiny, low-powered BMX160 sensor is made up of an accelerometer, a gyroscope and geomagnetic software. It'll support applications such as 3D indoor mapping and smartphone optimised virtual reality applications. Essentially, it's going to be a big deal in the quest to make wearable tech more accurate and improve the mobile VR experience all without sacrificing those slim form factors. The Sony SmartWatch 3 is still our current Android Wear champ, so we're always happy to hear when the affordable, GPS-packing smartwatch is set for more improvements. With the latest SmartWatch 3 software update (build number MWD49B), Sony has sought to address some stability and security issues. It's also fixing GPS issues, making battery life improvements and reintroduced the reboot option. Sony updated its Android Wear watch to Marshmallow earlier this year, and with the SmartWatch 4 still missing in action, it looks like we'll have to live with the regular software updates until it does turn up.